Anthropology, recipes, and conversational storytelling find an appealing blend in a labor-of-love volume by the prolific, widely traveled Arizona-based author. McNamee (Aelian's On the Nature of Animals, 2011, etc.) points out that he has been writing this book “all my life,” and his experience shows. He traces the region, its inhabitants, and their diets back to prehistoric times, including the simplest of possible recipes for “roast mastodon.” Beginning with the era of exploration, the author shows how new cultures, tastes, and ingredients combined with the region’s natural resources to expand the ever changing cuisine. 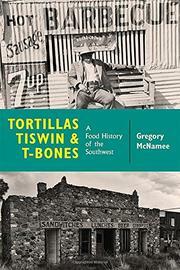 “Corn, beans, squash, chiles, the four essential plants in the cuisine of the Southwest, along with various animal proteins,” he writes. “Put them together, and you have the makings of an adventurous, nonrepetitive, even exciting cuisine…a storied and varied food tradition that extends back thousands of years.” As settlers extended the region, the cuisine expanded as well, with the dry desert of Arizona producing different twists on the basic elements from seafood-rich Southern California. The cattle country of Texas and the flame-cooking traditions of black settlers descended from slaves spawned the barbecue celebrated in that state, different from the pork-dominated barbecue throughout the eastern part of the South. One origin theory for the chimichanga suggests that it’s a crossbreed between the burrito and the Chinese egg roll, as immigrant cultures borrowed from and adapted to each other. “People from one culture meet people from another culture,” writes McNamee, “and in time they become a third culture, neither one nor the other.” The author extends the menu well beyond the clichés of Southwestern food, telling how California gave birth to chop suey and the first Italian restaurant in the U.S. as well as the fast-food franchising industry, all trends that have spread across the country and throughout the world. Note: McNamee is a freelance contributor to Kirkus.